Wycombe Wanderers boss Gareth Ainsworth has said the club is progressing quicker than he expected. 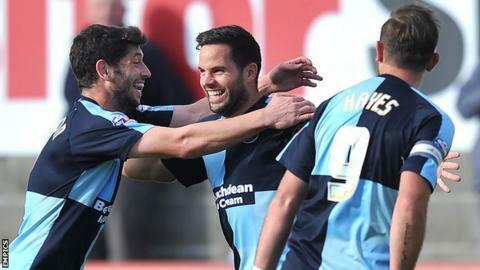 The Chairboys beat Morecambe 3-1 on Saturday to go top of League Two, five months after narrowly avoiding relegation to the Conference. "I won't get carried away. The club is about building slowly now," Ainsworth told BBC Three Counties Radio. "It has taken off a little quicker than I thought it would. But I'm not going to complain. I'm really pleased." Wycombe have had to focus on improving both on and off the field, with the club coming through a period of heavy financial losses and a failed takeover bid. A potential buyout in the summer never materialised and, with local businessman Andrew Howard becoming chairman, the Buckinghamshire side have instead focused on becoming financially viable. But despite a smaller budget, Ainsworth has taken the Chairboys to the summit of the league - although survival remains his priority. "Deep down I want to get as many points as possible on the board as we can," he said. "You won't get anything else from me until we get just over 50 points to keep us in League Two. Then I might talk about something else." Wycombe will assess defender Aaron Pierre, who had to come off at the weekend with a head injury.